The talk around the water cooler is The Information Diet as the year begins. Read. Not too much. Mostly Facts. 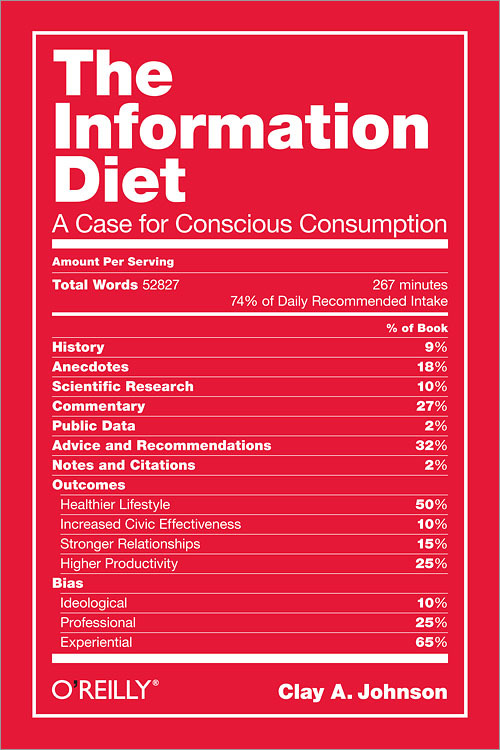 Based on the O’Reilly book by Clay A. Johnson, The Information Diet, A Case for Conscious Consumption I think it is time to get going on this topic. Buy the book, read the cover, read the sample chapter on O’Reilly, read the Lifehacker article on the topic, but get going. The modern human animal spends upwards of 11 hours out of every 24 in a state of constant consumption. Not eating, but gorging on information ceaselessly spewed from the screens and speakers we hold dear. Just as we have grown morbidly obese on sugar, fat, and flour—so, too, have we become gluttons for texts, instant messages, emails, RSS feeds, downloads, videos, status updates, and tweets. 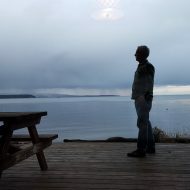 We’re all battling a storm of distractions, buffeted with notifications and tempted by tasty tidbits of information. And just as too much junk food can lead to obesity, too much junk information can lead to cluelessness. The Information Diet shows you how to thrive in this information glut—what to look for, what to avoid, and how to be selective. In the process, author Clay Johnson explains the role information has played throughout history, and why following his prescribed diet is essential for everyone who strives to be smart, productive, and sane.